The importance of ginger can be dated back to the writings of Confucius. In 9th century Europe, powdered ginger was placed on the table alongside salt and pepper. The candied ginger heart. I did put my heart and soul into this! Being from Boston I am a big fan of Emack and Bolio’s. In fact, they affectionately refer to themselves as “The Boston Ice Cream Experience” which I think is quite accurate. Though desserts were a rarity in our household growing up, I do remember occasional outings to Emack and Bolio’s. I always thought that their name was really funny. To be honest, I don’t think I ever started pronouncing it correctly until about last year. True story. Recently a friend wrote to 365scoops in a moment of desperation, panicking because a super fabulous Emack and Bolio’s flavor had been discontinued. The original Emack and Bolio’s flavor, I’m told, was called “Triple Ginger Mama” and was some sort of vanilla base with ginger flavor and lots of texture. This flavor was affectionately referred to as “vanilla/ginger amazingness”. Trying to decode that description was a little hard, so I took some liberties and attempted to recreate this recipe with my own 365scoops flair. So, since I’ve been wanting to make a white chocolate ice cream for a while, this just seemed like the perfect opportunity. I wanted to subtly introduce the ginger flavor, but not go overboard because I’m not such a fan of ginger in my ice creams (give it to me in Asian cuisine or salad dressings and I’m game though!). Additionally I thought that little chunks of caramelized ginger would give a nice added texture and treat without making the ice cream too “aggressively ginger.” So, that just leaves me with one thing…the recipe! This ice cream recipe has two parts; the actual ice cream and the candied ginger. You should make the candied ginger first unless you have enough kitchen space/pots and pans to make it while the ginger is steeping in the milk. I, however, live in NYC, and therefore it was just too tight in the kitchen to make all this work at once ! It may be hard to tell, but that's a lot of ginger! Don’t be scared but this recipe calls for a candy thermometer. Actually, you don’t really need one, but I can say unequivocally that I would have ruined this recipe if I did not use the thermometer. There. I said it! So, while I typically shy away from any recipe that requires a candy thermometer, they’re much easier to use then I thought, and way less intimidating! Slice the ginger as thinly as possible. It can’t be too thin, so use a sharp knife. Put the ginger slices in a non-reactive pot, add enough water to cover the ginger, and bring to a boil. Reduce heat and let ginger simmer for ten minutes. Drain, and repeat, simmering the ginger slices one more time. After the second time boiling the ginger, do not drain the water; you’ll be adding to it for the rest of the recipe. Success! 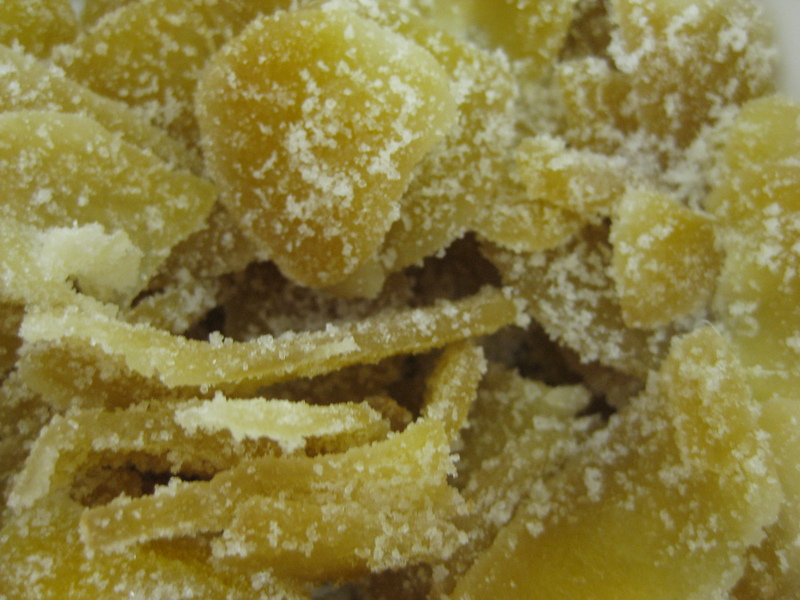 225 degrees F. Home-made candied ginger is on its way! 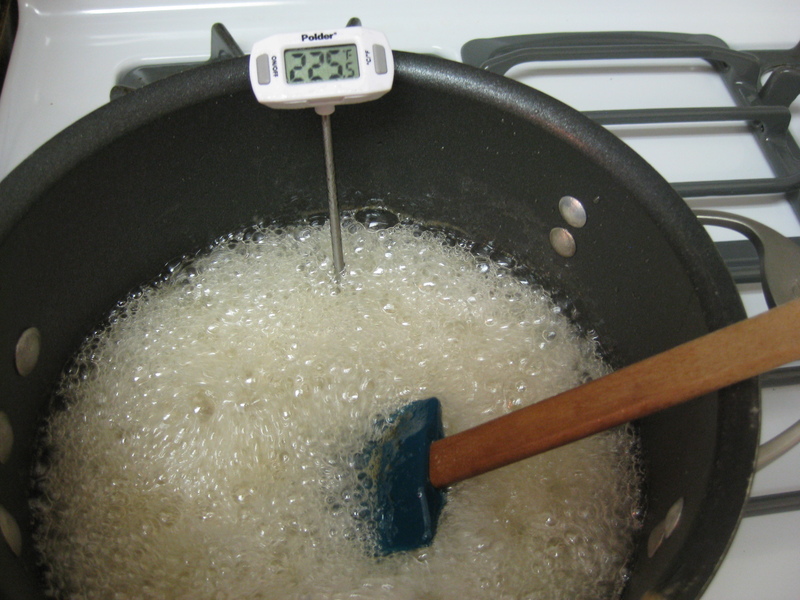 Mix the sugar and 2 cups water in the pot, along with the ginger slices, and cook until the temperature reaches 225 degrees F. This is where the candy thermometer comes in handy. The temperature will rise rapidly to approximately 17o degrees F and will hover around there for approximately 10-15 minutes. It will then continue to slowly rise until it reaches 225, again hovering around 215 degrees F for a while. You’ll need to keep watching the mixture, and periodically check the thermometer to make sure. All in, this takes approximately 20-30 minutes. Remove from heat , drain very well while the ginger is hot, and toss the drained slices in granulated sugar. Shake off excess sugar, and spread the ginger slices on a cooling rack overnight, until they’re somewhat dry. The sugar can be reused in a batter or ice cream base, or for another purpose. The ginger syrup can also be used for home-made ginger ale. 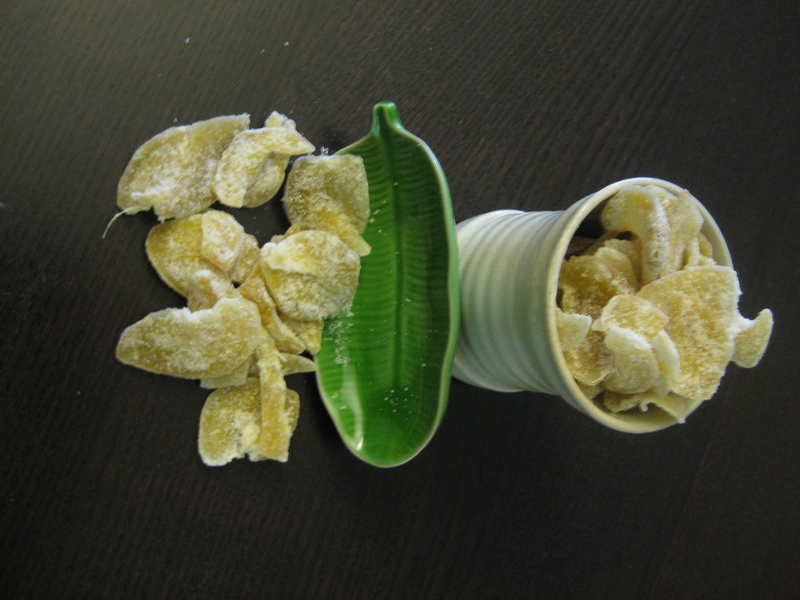 The candied ginger can be stored at room temperature for at least a month. This recipe will yield plenty for snacking or gifting. 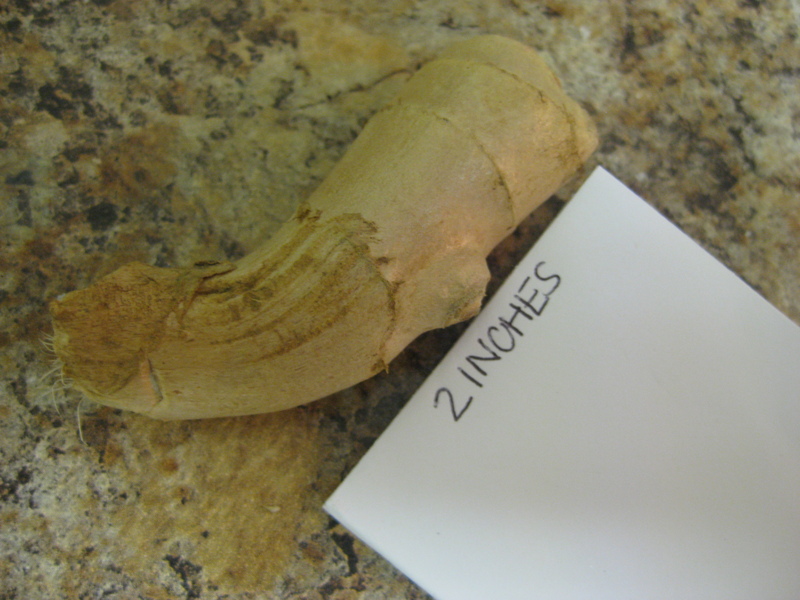 I did not have a ruler to measure out the ginger...so I fashioned one by folding a 4 inch envelope in half. Crafty, I know! 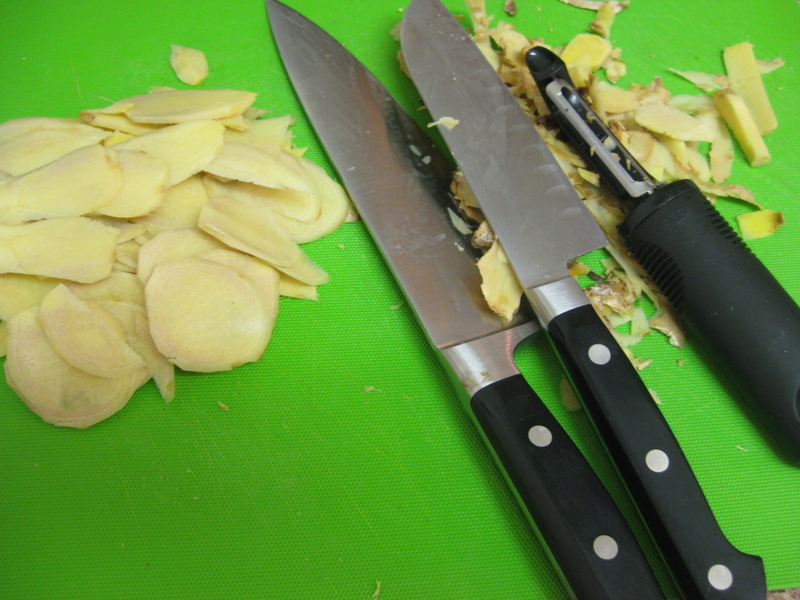 Peel and slice the ginger very thinly and cover it with water in a medium saucepan. Bring to a boil and cook for two minutes. Drain away the water but return the blanched ginger to the pan. Add the sugar, milk and 1 cup of the half-and-half. Rewarm the mixture, turn off the stovetop, cover the mixture and steep for at least an hour, or until you are satisfied with the ginger flavor. I steeped mine for 1 hour and it was a very mild flavor – which is what I wanted. (But if you really like ginger I suggest you use either 3 inches of ginger or let it steep more. Once you add the white chocolate mixture it will dilute the ginger flavor a lot). Chop the white chocolate and put it in a microwave safe bowl. Melt on high for 30 seconds, stir and see whether you need to melt it again, if so, repeat. 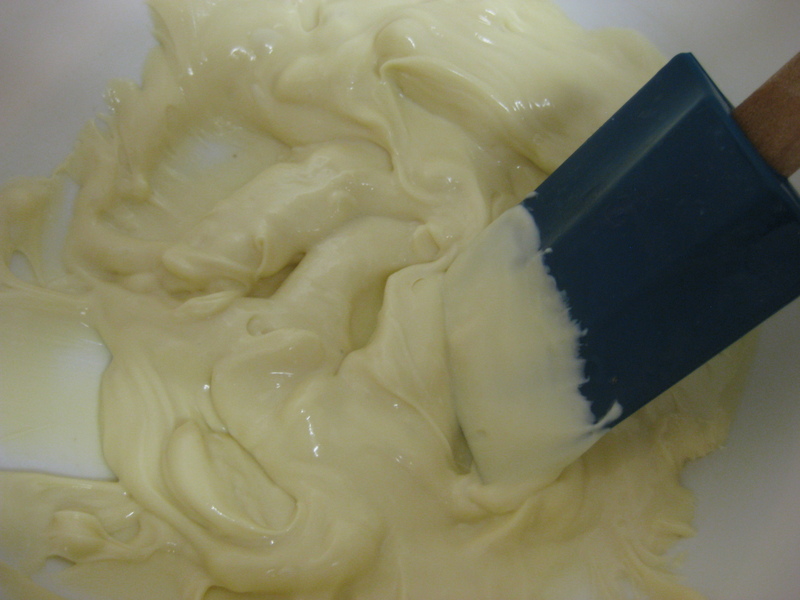 Whisk the white chocolate into the milk mixture. Add in the remaining one cup of half-and-half. Pour the mixture through a strainer and discard the ginger. Cool completely (at least 2 hours) and then pour into the bowl of an ice cream maker. Freeze according to the manufacturer’s instructions. Approximately five minutes before the ice cream is done churning, slowly pour in the candied ginger pieces. When finished, scoop into a container and let freeze for at least 2 hours before serving. 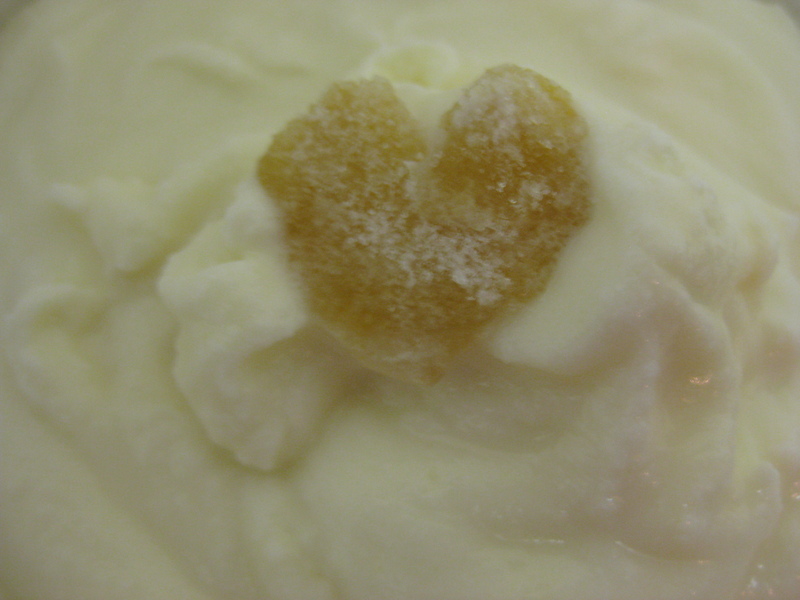 You’ll notice that I cut one piece of ginger into a heart, and placed it on top of the ice cream. Let’s just say it was a cute surprise when the newly engaged couple opened the container! The Verdict: Folks, I think they liked it! One of the royal taste testers got down on one knee and asked me to marry her (I politely declined, though I was flattered. I just didn’t think The Husband would want to give me up that easily!) Another taste tester said “many things are frozen but not all things are chosen”. I liked that rhyme, and again, I was flattered. And of course, the dear friend who requested this flavor seemed really happy with it. I hope you’ll all try this flavor at home.